AAA+++ SELLER, FAST SHIPPING, ITEM AS DESCRIBED!!! Great shipping speed. Card looked amazing. Good communication. Great seller. Great product great seller. awesome awesome awesome very happy. Great seller !! Fast shipping !! Thanks !! Have a busted up PS3 charger? Do you have a busted up PS3 charger? Do you want a better and more high quality charger? 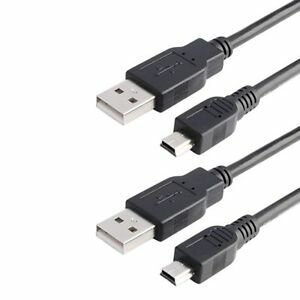 Well, the "2pcs 6ft USB Charger Charging Cable Cord for Sony Playstation 3 PS3 Controller" is for you! It is 6ft long, so when you want to charge the controller while playing, you can keep your distance from the TV and keep your eyes safe! I've had this for 3 weeks now, 0 issues with it. Just plug it in, and you got a charging controller! Great product ! Doesn’t charge the PS3 controllers ! Great quality & fabulous craftsmanship, however, they will not charge a single PS3 controller of mine. I have found that, lately anyway, that only true “PlayStation” brand cables seem to charge the controllers. I don’t think the pin setup inside the cables are correct, as this is my 4th set I’ve ordered off brand & had them not charge the controllers. So I went ahead & bought charging stations, which have worked perfectly ! Great quality for the price, good buy.